BENTON - Billy Grammer, a Benton native and legendary country musician, died early Wednesday morning. He was 85. Grammer died at 12:20 a.m. Wednesday in Benton Hospital after a long illness, said his widow, Ruth. His own hits include "Gotta Travel On," which sold more than a million copies and also was recorded by Bob Dylan, Webb Pierce and performed by Buddy Holly on his last tour. Grammer also toured with artists including Jimmy Dean and Grandpa Jones. In the studio, he played on albums by Louis Armstrong, Patti Page and Charley Pride, including on Pride's hit "Kiss an Angel Good Morning." Although he stopped actively performing more than 20 years ago for health reasons, Grammer returned to the Grad Ole Opry to perform on occasion. When he retired, Grammer built a house on what was originally his family's land, Grammer Hill in Sesser, where his grandfather, a Civil War veteran, is buried. Born in Benton in 1925, Grammer grew up in Southern Illinois. After spending time in the military, Grammer married his childhood sweetheart, Ruth Burzynski, to whom he has been wed for 64 years. While the two were living in Washington, D.C., Grammer was hired as a singer at WARL in Arlington, Va., by Connie B. Gay, a popular country DJ. When the lead guitarist was fired, Grammer took up double duty and began honing his skills on the fretboard, which would make him famous. 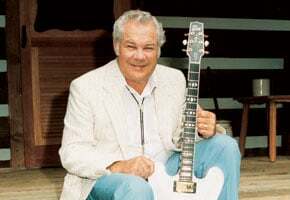 While performing as a sideman on Jimmy Dean's television show, Grammer met a young Roy Clark, who was primarily a banjo player at the time, and taught him a thing or two about playing guitar. In the 1960s, Grammer developed his own line of guitars. One that was owned by Johnny Cash was sold at auction for $131,000. Grammer said the most memorable moment in his career was the first night Roy Acuff introduced him on the Opry broadcast, which he grew up listening to. Another was delivering the invocation for the opening of the Grand Ole Opry House in 1974 in front of President Richard Nixon.